For many, the E39 was the last good-looking 5-series there was. For today’s Nice Price or Crack Pipe, we’ve got one that’s said to also look like new, but will that and its six speed make its price a looker too? Considering it looked fun, interesting, and like an opportunity to roll your sleeves up and tackle some not all that daunting work, yesterday’s 1980 Toyota Celica ST Sunchaser had it all. And for only fifteen-hundred, it had itself a 72% Nice Price win as well. Fifteen-hundred bucks isn’t all that much these days. Hell, Donald Trump pays more than that per day for the desperate tears of poor children needed to keep that ragged mop on his head from turning to straw, damn gypsy curse! Of course, when it comes to cars and trucks your pickings can be pretty slim in that financial sector, which leads many to check the couch cushions for loose change, and perhaps cash-in those bonds your Mee-Maw gave you on your ninth birthday. Then perhaps you could get something a little nicer, and maybe a little more to your own personal taste. This 2000 BMW 540i looks pretty nice, and with its mix of M-sport accoutrements and 6-speed Getrag stick shift, it’s probably something you wouldn’t mind getting a tasty taste of too. Black on black over a decent-looking set of Parallels, the car is claimed in its ad to have been adult-owned and never abused. Who doesn’t like that? The ad also says that the interior is immaculate, and aside from indicating some wear marks on the seats and glossing of the wheel, the pictures bear that out. Plus, take a gander at that shot of the command center, resplendent in its German ergonomics, sport seats, and burl wood - if that doesn’t give you a little piss shiver of desire then you might want to see if your breath shows up on a mirror. The outside is said to have some minor wear here and there, but overall the seller claims this 182,000-mile car to look and feel like new. Having possibly missed the opportunity to buy one back when they were new - fully fifteen years ago! - here’s a potentially a good chance to right that wrong. That is, if you are a fan of the breed and are somewhat flush. Here’s the thing, there are a ton of E39 540is on the market right now, hell the car was sold for almost a decade. Every ad for one with the 6-speed claims that version to be the rarest duck there is in the States, and they are pretty much correct. However, seemingly even more rare is one like this car which is both a sticky-shifter AND doesn’t seem to be eff’d up in one way or another. It’s true, these cars are complex and, owing to the years they have lived, are somewhat fragile in certain areas. That means maintaining one can be hazardous to your wallet. Go ahead and look around, there are a number of them out there being sold by present owners who can’t find it within their bank account to fix things like window mechanisms, leaking exhausts, or just figuring out what’s keeping the car from passing smog. And they want serious cash for these wounded soldiers too! This one’s major complaint is apparently a squeak in the steering wheel. Yeah, that’s totally annoying, but it’s better than pretty much any other mechanical malady one could think of to have to deal with. And yet, the reason the seller gives for wanting to be rid of the car is because they can’t afford to maintain it the way it deserves to be maintained. Geez, if that was the family dog they were talking about, or grandma, I’d be in tears right now. Instead, its a semi-finicky car that I think most of us would still like to step up to bat for. That bat - or well, the car - has an asking price of $6,000. You will find the Getrag-equipped 540i available all over the web for more and for less, but most of those have issues - just like your ex. This one seems like a good choice if an E39 is on your bucket list, but is that a good price? 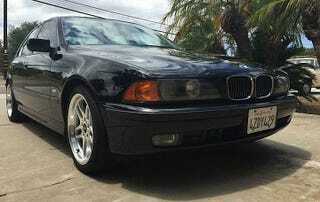 What’s your take on this Bimmer for that kind of cash? Is that a deal to be almost as good as new? Or, is that price just old news?